So how does my perfect day in Amsterdam look like? I'll start with breakfast at Café de Jaren: great sandwiches (goat cheese with honey! ), good choice of newspapers and one of the nicest terraces overlooking the Amstel river. Then off to browse book shops. For the widest choice of contemporary books Scheltema is my top choice, for English language books to the American Book Center and for the best spiritual books to the Zaailing in the Ruysdaelstraat. For rare and out-of-print books to De Slegte in the Kalverstraat or, if it's a Friday morning, the second-hand book market on the Spui. The rest of the morning is spent biking along the canals and doing some shopping. First I'll some birthday presents at the small original shops in the Oude Hoogstraat, then I'll find some queer stuff at the Waterlooplein flea market for home decoration. I'll have lunch in Café Dantzig inside the city hall building (Stopera) right next to the Waterlooplein - at least if there aren't any local politicians, in which case I'll rather hop over to any of the places at the Rembrandtplein to watch people and listen to the street musicians. Next on my list of things to do in Amsterdam is visiting some museums. 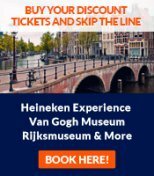 I'll either go to the Scheepvaartmuseum (Maritime Museum) or the Rijksmuseum to admire the 17th century "Dutch Master" oil paintings, or visit the painter Rembrandt's former home at the Jodenbreestraat, or delve into 18th century Russian culture in the new Hermitage. If I feel like just sitting and watching the city glide by a bit, I'll take a canal boat tour from the Damrak (where you have the biggest choice), the Amstel or the Leidseplein area. Each time I see and hear something new. We will either picknick on the grass or use the terrace of the beautiful Filmmuseum (which is more of a café than a museum, by the way). For dinner, I'll go to the Malaysian restaurant Wau, or any other Oriental restaurant in the Nieuwmarkt area, for the finest satay in Amsterdam. In the evening, I'm out to see a movie. If I'm in the mood for alternative or art movies, 'The Movies' at the Haarlemmerdijk or the Filmhuis at the Ceintuurbaan. For mainstream movies my favorite is the beautiful art deco Tuschinksi theater in the Reguliersbreestraat. When biking home, if I'm hungry, some fast food from any of FEBO's vending machines - it doesn't get more Amsterdammish than this. 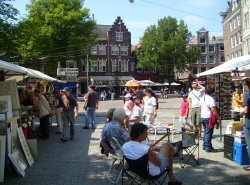 Also find out about Amsterdam Advisor authors Declan's and Georgeta's favorite things to do in Amsterdam.